During the Republican period, in the second century B.C., the port system of Rome was centered on the maritime ports of Ostia, at the mouth of the Tiber, and Pozzuoli (Puteoli), on the bay of Naples, and on the Emporium, the river port on the left bank of the Tiber at the foot of the Aventine Hills (the modern Rione Testaccio), that soon became the main service center of the city. The strong demographic growth of Rome during the late Republican and the early Imperial periods (from the first century B.C. to the first century A.D.) and the resulting difficulties to supply the city, highlighted the logistic shortfalls of the port system established in the Republican period: the port of Ostia had a scarce capacity and the port of Pozzuoli was located too far. This led Emperor Claudius to establish a new maritime port 3 km to the north of Ostia, starting from 42 A.D. This large port of about 200 ha, soon proved to be unsafe in case of storms and often silted up. Less than 50 years later (second century A.D.), Trajan had the port redesigned, with a new inland basin connected to the Claudian port, that became the external basin, and an improved connection with the Tiber through the fossa traiana (currently the canal of Fiumicino). During the same years, Trajan had also the port of Centumcellae (Civitavecchia) built 80 km to the north of Rome. A huge service complex, the city of Portus, gradually developed in the area surrounding the new port facilities and became the main maritime port of Rome until at least the sixth-seventh centuries A.D.
Pozzuoli and Ostia continued to function even after the construction of Portus and were further developed. In fact, the first was a good port located south of Rome in a very important economic area; the latter was a port located at the mouth of the Tiber and a large administrative and commercial center directly linked to Rome by the Tiber and the Via Ostiense, and to Rome by a canal and the Via Flavia-Severiana. 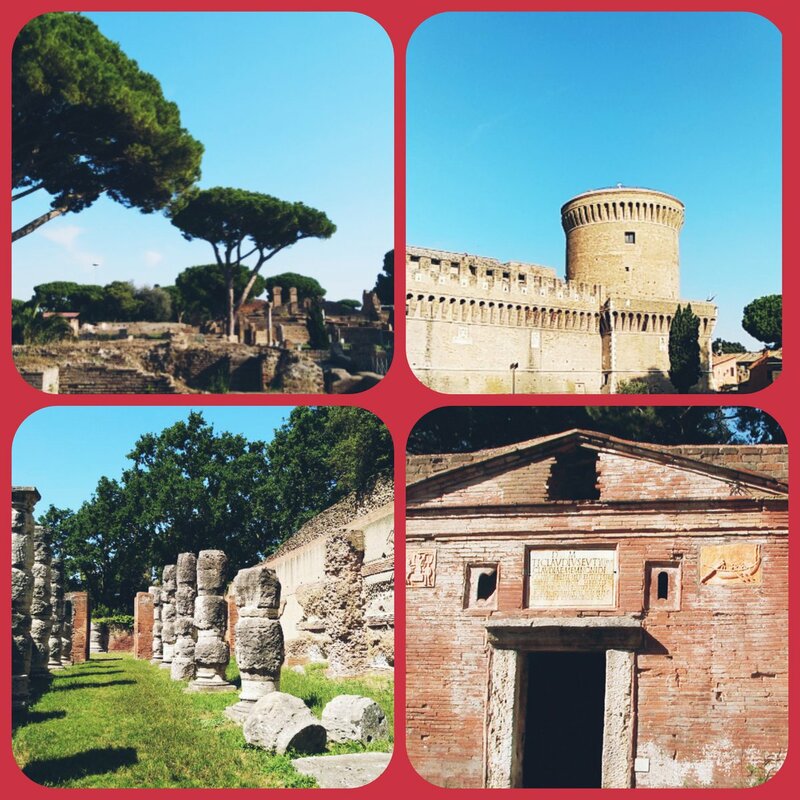 Ostia remained the administrative heart of this system until the fourth century A.D. when, under Emperor Constantine, Portus became an autonomous municipality, which shows its paramount importance as a supply centre of Rome. From the second century B.C. onwards, the construction of a new river port on the Tiber was started in the area of Testaccio at the foot of the Aventine Hills. This area was fenced and paved, and equipped with mooring facilities for ships. In order to cope with the water level fluctuations caused by the river floods, the port was progressively enlarged, and its quays were paved with large slabs of travertine and provided with holed stones for safe mooring and unloading of ships during flood periods. In the first century A.D., a new three-storey building was erected behind that complex. It consisted in a double row of large vaulted storerooms along the river-bank, that were illuminated by skylights opening up on the Tiber bank, and by carriage doors on the opposite side. This building was then enlarged with a new structure consisting in a series of rooms closed by a big inclined wall, and other inner spaces with skylight openings to admit day light. In the second century B.C., the Porticus Aemilia was built behind the port. It was a huge new ancillary building, 487m long and 70m wide, consisting of 52 naves facing the river side. Over time, the commercial district of Rome was developed behind that area, with department stores, services and the Monte Testaccio dumping ground.